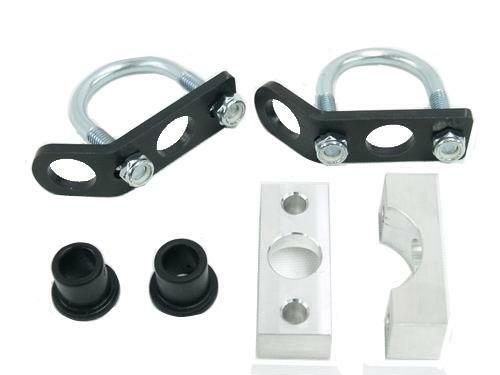 K-Tuned Traction Bar Brackets - Dezod Motorsports Inc - Home of the automotive performance enthusiast since 2002. Here is another useful part from K-Tuned. In the past, alot of people ruined the coating on their traction bars by welding on custom tabs to mount the radiator on the bar in their car. We have done the work for you and finally you can easily and cleanly mount most radiators on your traction bar. These Stainless Steel brackets are perfect for rad swaps and rad relocation for K-swaps. These even work with our competitors bars as long as they are using a 1.5” OD (outside diameter) main bar. Don’t forget to be sure there is enough clearance for the U-bolt to wrap around the bar. Mounting a radiator really doesn’t get any easier.